Vegan Kale & Artichoke dip is a healthy spin on the classic spinach artichoke dip. 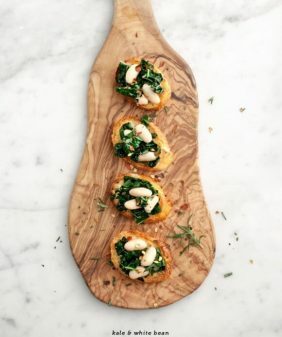 It's the perfect appetizer for holiday parties or winter gatherings! Hey all, Jack here – now that it’s the end of the year, it’s holiday party time! And what does it normally mean to eat at a party in the winter? To a lot of Americans, that means spinach artichoke dip. I mean, what makes you feel like partying more than eating an entire loaf of bread dipped in cream cheese and mayonnaise? Well, Jeanine and I don’t really think that’s much of a party any more. Our idea of a party is one where the next day you (or your guests) don’t feel awful. 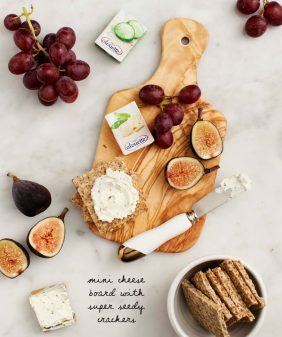 So we took a bit of inspiration from the classic party dip and made a spread that is still irresistible but infinitely more healthy. It uses two of our favorites for creamy vegan indulgences – sunflower seed puree and chickpeas. And the spinach is subbed out for kale, because why not? I won’t lie though – I still ate way too much of this. Place HALF the artichoke hearts in the blender, coarsely chop the rest and set aside. To the blender add the sunflower seeds, water, chickpeas, garlic, mustard, lemon, nutritional yeast, and a generous amount of salt and pepper. Blend until creamy. Taste and adjust seasonings. In a small skillet, cook the chopped kale in a little bit of olive oil (with a pinch of salt) until wilted. Set aside. Transfer dip to a bowl and stir in remaining chopped artichoke hearts, the cooked kale and chives. (Taste again). Chill until ready to serve. 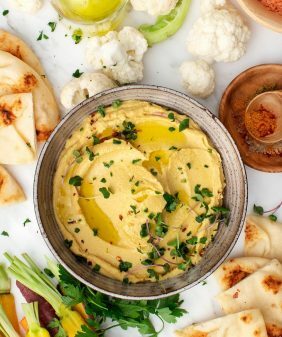 Serve the dip by itself with crackers or toasted pita wedges - or make crostini with a few extra toppings: Add some more olive oil to your skillet and cook the chickpeas until lightly browned. 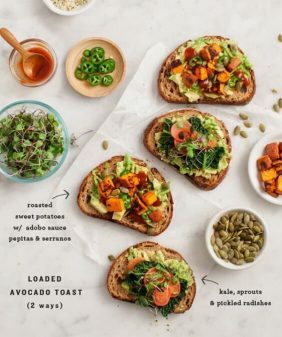 Top each toast with a slather of dip, some extra cooked kale, roasted chickpeas, pickled onions (optional), and a pinch of red pepper flakes. If you don't have nutritional yeast (and you're not vegan), you could sub 2T pecorino cheese (or more to taste). Or you could skip it altogether - it just helps give the dip a slightly richer cheesy flavor. 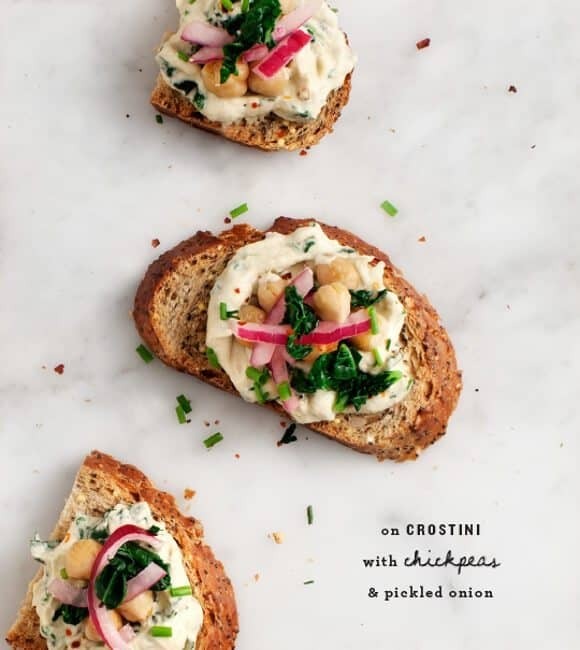 These crostini look wonderful and I can totally picture myself serving this dip like you did for some Christmas party or gathering with friends. Mmm this looks scrumptious! I’m sure I could easily polish off a bowl of this haha! I’m dying to try this. I love, love, love the kale in this! And the sunflower seeds! yum this sounds even better than the original version. I can’t stomach the heavy kale artichoke dip so this would be a great option! Thanks for sharing! This looks beyond amazing! I am having a little pre-party before watching the last Hobbit movie (geek alert!) and will be whipping this up as an appetizer for everyone. Thanks so much! 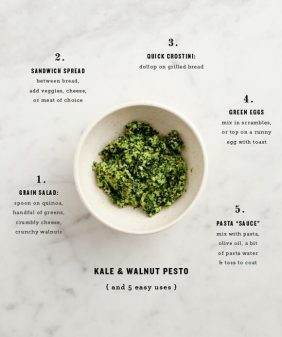 I literally ate just about an entire bread bowl full of the traditional spinach dip at my nephew’s b’day party yesterday, now while it was super yummy….I think this version looks way healthier and still quite tasty. I love that you subbed in kale for the spinach, a great update. Now I’ll still probably eat too much of this, but at least it will do my body a bit better. Thanks for a great sounding swap out! Happy Holidays to all. One of my favorites, but I hardly make this dish anymore because of the less-than-healthy ingredient list. Can’t wait to add this to our Christmas Eve anitpasti spread! 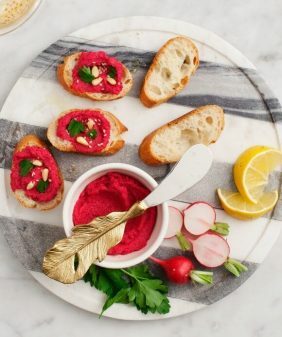 Looks wonderful and a welcome deviation from the heavy cream based dips everywhere this holiday season! Yay, artichoke dip! I love the idea of punching it up with plenty of greens. So perfect for a holiday party! I’ve made your sunflower seed cheese and it was really tasty, so I know this dip will be delicious. Can’t wait to make it as part of a holiday spread! My husband is allergic to dairy and nuts, so this recipe is making me nearly giddy! I miss the traditional dip so much, and can’t wait to make this. 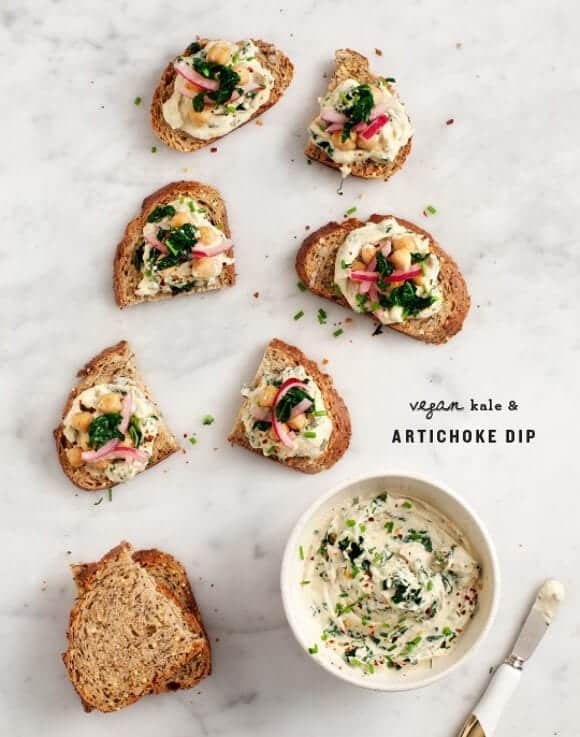 This looks amazing–love artichoke dip! Oh MY this looks like a fabulous appetizer!! Pinned! I am a big fan of spinach & artichoke dip! Your dip sounds delightful & I will make it soon. Thanks for sharing! Sunflower seed and chickpea purée sounds so creamy and delicious. I’m adding this to my appetizers-only dinner menu! I made this as part of our Christmas dinner. Very good. (Along with the kale and shiitake mushroom stuffing. Also delicious!) Backstory… last week my husband suggested that we tweak our diet to be vegetarian, low fat, minimal dairy… to eat in a more “heart healthy” way. (Just in time for Christmas nonetheless.) Anyway… we’ve tried this before, but now with Love and Lemons as a resource… It is going way better (even for our 3 and 5 year old boys)! Thank you Jeanine. Hi Kristy, I’m so glad you’ve liked the recipes! Thanks for coming back to share :). I made this for a christmas party last week and the bowl was literally licked clean -everybody loved it! (Health nuts and non-health nuts alike!) Thank you! ha – I’m so glad, thanks for the feedback! Love to win over the non-health nuts :). Definitely trying these & maybe try our roasted rosemary garlic sea salt with them. I love the idea of a much healthier option! I can’t wait to make this. But, please, when you say a can of artichokes, can you please say how many oz. or cups? I don’t know what size can you’re talking about and I buy big jars of artichokes at Costco. Please let me know someone? Just in time for holidays!! Thanks- brunch is on Wed, and I was ‘dreaming of something lighter and healthy’ for my coffee gang!! A few others will get used, saved, and made again and again!! So far I have made this twice and I love it! I have the world’s worst blender and it comes out great every time. I also use this as a vegan caesar dressing and omit the kale part since I’m adding to a big bed of kale. Couldn’t be easier and my omnivore friends love it! Hi Heather – I’m so glad you’ve loved it! Great idea to convert it to a caesar dressing – sounds delicious!